Tomorrow is the big day. The day when I put on comfortable yet unflattering Lycra. The morning I don’t stand in front of the mirror with make-up. 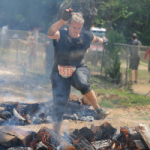 Instead, I’ll be waking up and challenging myself to one of the most difficult obstacle courses that I’ve ever completed.